Botley School Cafe 18.6.2015 - Outside in the summer sunshine! In their fourth week of the Empowering Assertive Boys sessions, the boys started off with a game of football during which they were encouraged to be assertive independently and solve problems assertively with little or no adult intervention. They also labelled their own Sycamore or Horse Chestnut tree sapling & continued their gardening work rejuvenating the Quad. On top of this, the boys made their own 'ID wallets' with a picture of them with their tree alongside reminders of their acheivements during this project. This week, the cafe was selling chocolate tea cakes & biscuits with added icing and sprinkles alongside orange squash, tea & coffee. This week, the boys who run our cafe managed to pick and sell their homegrown, organic leaf vegetables and herbs for only 50p a bag, reduced to 20p a bag for the last few; much cheaper than your local supermarket! 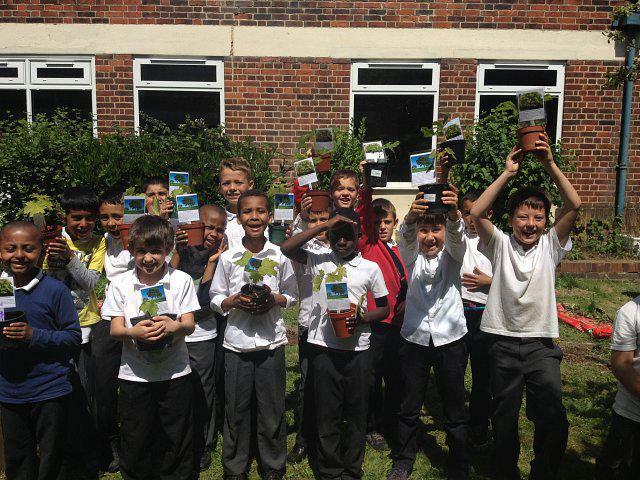 The boys were also introduced to their own tree sapling for them to nurture over the coming weeks with the aim of eventually donating them to the local Wytham Woods or planting them on the school grounds. The cafe was open for business again this week with customers enjoying a refreshing drink and a delicious snack in the summer sunshine. The boys who run the cafe have been learning all about positive assertiveness through team building games & other activities. As well as growing fresh vegetables for the cafe, they have also been doing some landscape gardening to rejuvenate the Quad in the centre of the school!